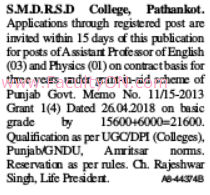 S.M.D.R.S.D College, Pathankot has advertised in the TRIBUNE newspaper for recruitment of Assistant Professor jobs vacancies. Interested and eligible job aspirants are requested to apply within 15 days from 29th September 2018. Check out further more details below. About College: Welcome to SMDRSD College the primer institution which has entered the 58th year of its existence. The college has earned name and fame not only in Gurdaspur but in whole region of this border belt of Punjab by dint of its persistent efforts to explore the unexplored heights of success and taking the students of SMDRSD college towards the path of success by setting trends for others and becoming role models in the field of academics, sports, N.C.C. and other related curricular activities. How to Apply: Interested and eligible candidates are requested to send application along with updated CV, all copies of certificates / testimonials and recent PP size photos to the postal address provided here.